My review copy: Review copy received from the publisher in exchange for an honest review. “If there's one thing I've learned, it's this: We all want everything to be okay. We don't even wish so much for fantastic or marvelous or outstanding. We will happily settle for okay, because most of the time, okay is enough." “I want love to conquer all. But love can't conquer anything. It can't do anything on it's own. Every Day is absolutely and completely extraordinary. It's unlike anything else out there. An excellent and brilliantly executed mix of contemporary romance and science fiction - beautiful, powerful and utterly unforgettable. Brimming with intensity, wit and soulful depth, it's a bittersweet tale of love, identity, and the power of human connections. It's not just a book. It's one of the best YA books on the market. A must have, must read, and must share. The premise of Every Day is quite simple, yet entirely unique and fresh at the same time. Sixteen-year-old A wakes up every day in a different body. Sometimes it's a boy, sometimes a girl - there is no pattern or rule for that. The only thing that doesn't change is age - all his hosts are always the same age as he is. He doesn't get emotionally attached, he doesn't do anything his host wouldn't do, he's merely an observer, a passer-by. Until he meets Rhianna, a girl who happens to be the girlfriend of one of his hosts. Until he falls in love, unable to resists, move on and forget. Until the universe comes crashing down on his head and the life as he knew it gets flipped upside down and inside out. Levithan artfully explores themes such as love, life, sexuality, equality, abuse and sacrifice. And he does it with unmatched cleverness, intelligence, honesty and sensitivity. Every Day is filled with inspiring, thought-provoking reflections and beautifully constructed, meaningful scenes. It's full of memorable quotes that are demanding to be read over and over again and then shared with your family and friends. The narrative voice is not only authentic and haunting, it's also - or perhaps most of all - strikingly and searingly intimate and personal. It's impossible not to be deeply affected by it. I loved A. I absolutely and utterly adored him. Everything about him - from the darkness and coldness within him, to how smart, understanding, thoughtful and caring he appeared - was magnetic. He was such a fascinating character. Opinionated, intelligent, passionate. He resigned himself to his fate, accepted it and tried to make the best out of every day, making sure not to harm his "hosts" and the people around them. He understood the hopelessness of his situation - he did not go looking for love; love found him. And it was the truest of all true love - the one that inspires you to do good. Selfless love. Pure love. “People take love's continuity for granted, just as they take their body's continuity for granted. They don't realize that the best thing about love is its regular presence. Once you can establish that, it's an added foundation to your life. 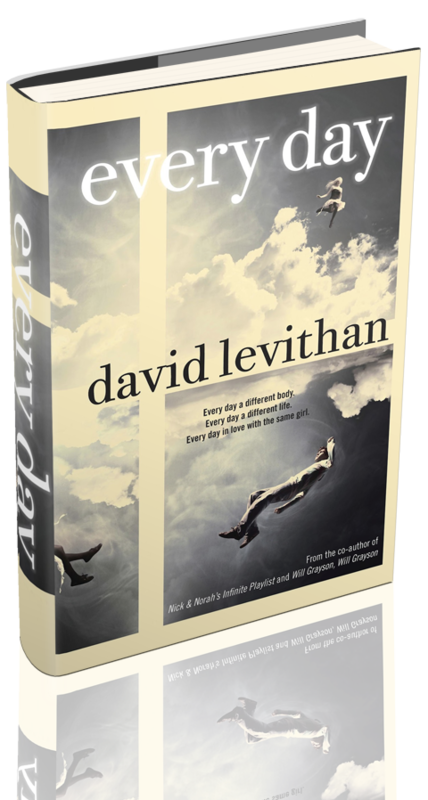 I love, admire and respect David Levithan. He is an excellent writer. His stories encourage deep intellectual and emotional engagement, they're not just something you read, put away and forget about. They stick with you. They make you feel and think. They change the way you see the world. They crush you to pieces and then glue you back together, leaving you all shaky and broken, but hopeful and satisfied at the same time. They're rare. Extremely rare. And Every Day is quite possibly the rarest one of them all. Don't miss it!